Artificial intelligence (AI) is poised to structurally disrupt the global economy. Encompassing computer systems that are able to perform tasks normally requiring human intelligence, AI has already impacted a wide variety of fields - from healthcare and education, to manufacturing and agriculture. The industry has been projected to increase at a compounded annual growth rate of over 50% by 2021, leaving the global AI field wide open for competition. Talent Base: Science, technology, engineering, and mathematics (STEM) fields form a major component of Tajikistan’s national education system. At the secondary school level, natural sciences – physics, chemistry, and biology – as well as mathematics and informatics are mandatory subjects throughout the course of study starting from 8th grade. The country has attained universal literacy while having near 90% secondary school enrollment rate – significantly higher than the global average of 76%. Tajikistani students regularly participate in international olympiads in STEM fields. 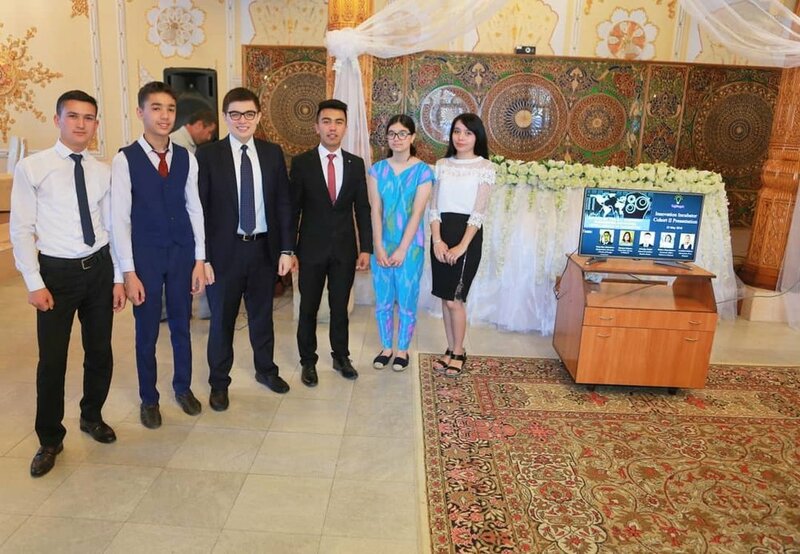 As such, the team of high school students from Tajikistan competing at the prestigious International Mathematical Olympiad (IMO) has finished second – only behind Kazakhstan – among teams from Central Asia in the past 3 years. TajRupt’s student body has included some of the most accomplished local students in STEM. Nurullo Sayfulloev, pictured on the right, is among them. 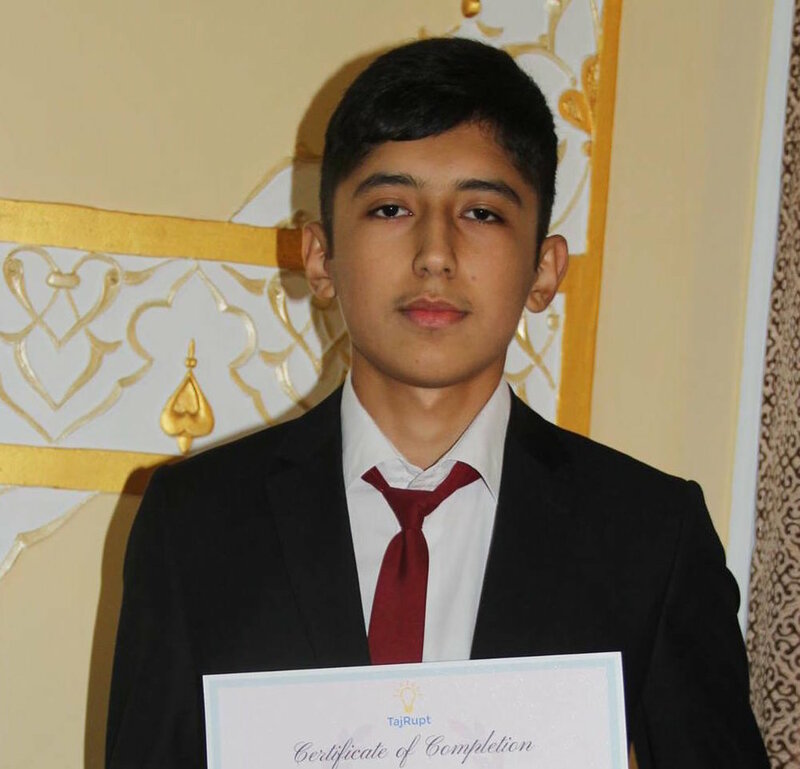 An 11th grade student, he is passionate about computer science and recently won the national project olympiad in informatics organized by the Academy of Sciences of Tajikistan – the country’s premier research institution administered by the Ministry of Education and Science. 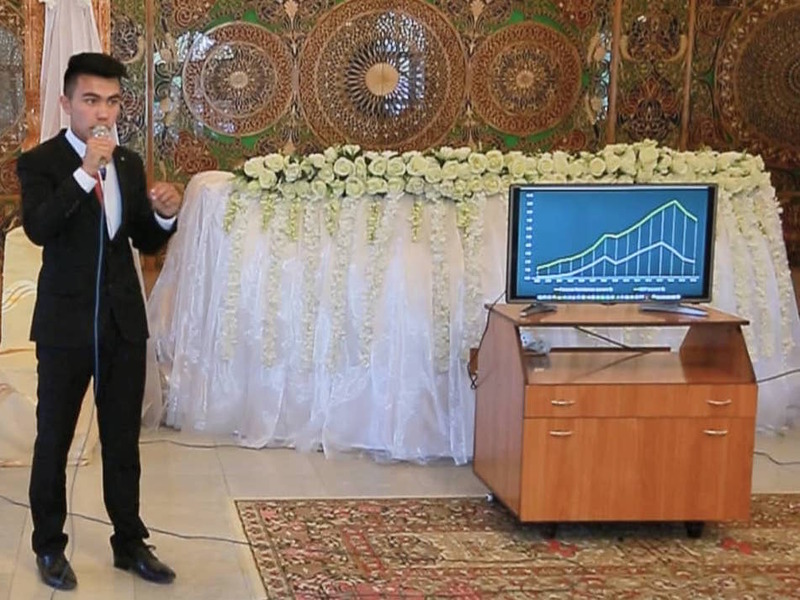 Nurullo developed interactive mobile and web applications for tourists visiting Tajikistan as part of the Government’s “Year of Tourism” initiative. 2. Regional hub: Central Asia has had limited exposure to artificial intelligence – both in academia and the private sector. 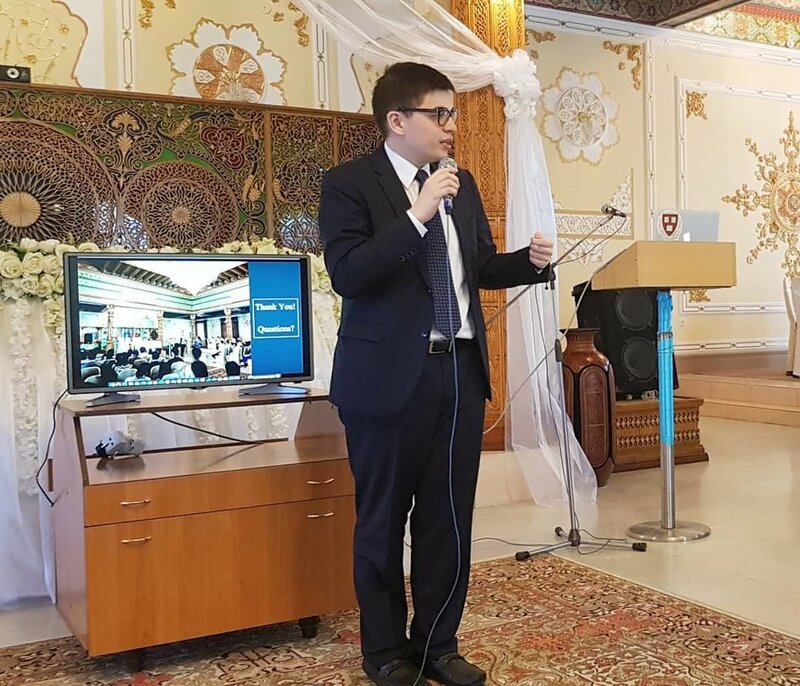 Lack of AI research in the region has demonstrated that the core issue stems from a deficit of research capacity in Central Asian universities. Tajikistan – being located at the crossroads of Central and South Asia – can attain a first-mover advantage in the region by building its AI capacity at the research level with a long-term goal of cultivating a leadership position in the AI economy of the future. We seek to fill in the existing vacuum of research capacity by establishing the TajRupt Artificial Intelligence Research Center (TAIRC) - Central Asia's first AI lab. Agriculture: A study by the Food and Agriculture Organization (FAO) of the United Nations determined that a third of the harvest in Tajikistan is lost due to low efficiency of protective measures against pests. 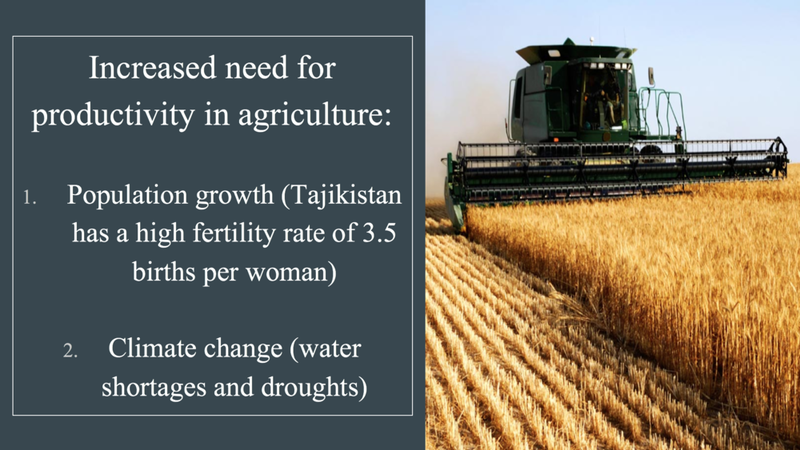 As such, deep learning algorithms can empower farmers in Tajikistan by increasing efficiency through soil and crop monitoring that would lead to timely detection and elimination of different forms of pests such as weeds. 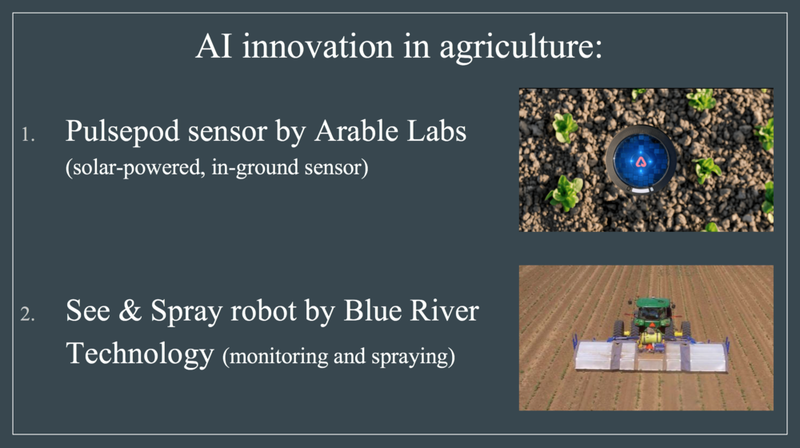 Moreover, agricultural robotics can automate much of the manual labor in Tajikistan’s agriculture in which 70% of the work is performed by hand – much of it repetitive in nature. Manufacturing: Labor-intensive manufacturing of silk and textile products are dominant in Tajikistan’s industry. 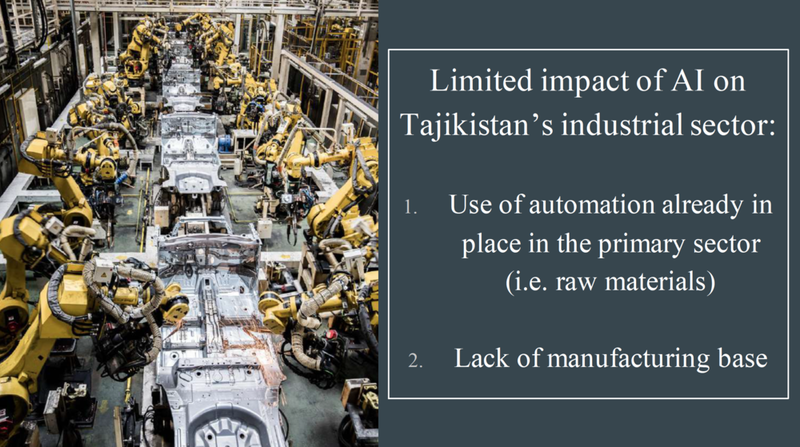 Automation of labor-intensive processes would make Tajik manufacturers more competitive globally by decreasing costs while increasing demand for high-skilled labor. It is noteworthy that potential reduction in demand for low-skilled labor is one of the most controversial aspects of AI, and undoubtedly needs further research and applied pilot projects – which is envisioned in our initiative. Financial services: Tajikistan’s financial sector has rapidly expanded in light of growth in migrant remittances. Meanwhile, Tajikistani banks have the highest share of nonperforming loans (NPLs) in the entire region – nearly 20%. At the peak of the country’s financial crisis in 2016, the share of NPLs had reached a staggering level of 58.7%. 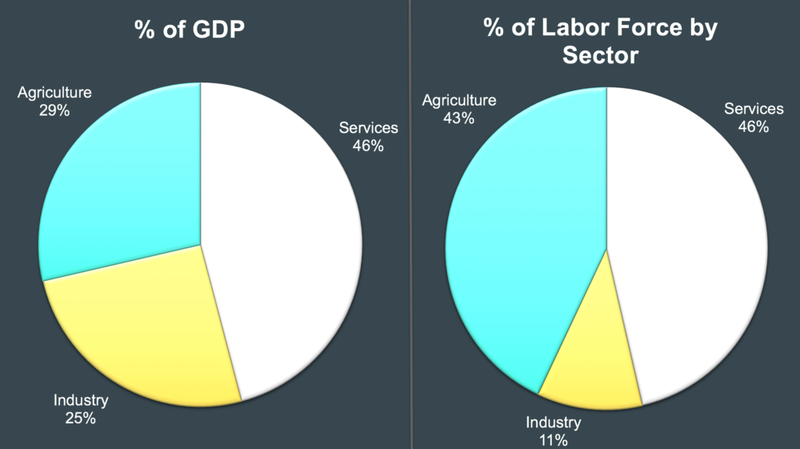 constantly shifting economic climate in both the country and the region. Therefore, machine learning algorithms could be applied in determining creditworthiness of individuals and businesses through examination of a wide range of data sources, as well as larger economic trends and social factors. Healthcare: Having the lowest per capita health expenditures in the region, Tajikistan’s healthcare sector is faced with a multitude of challenges. Among them is the clinical validity of medical prescriptions. A report by the World Health Organization (WHO) concluded that “lack of evidence-based clinical guidelines” has contributed to low quality of care provided in Tajikistan’s hospitals. AI machines can be specifically utilized as a diagnostic tool in assisting doctors with pattern recognition and prescription through analysis of medical journals and patient databases. TajRupt.AI is planned to have two concurrent focus areas: education, and applied research. Education: TAIRC will train the most talented high school and undergraduate students in STEM in the foundations of artificial intelligence and data science. 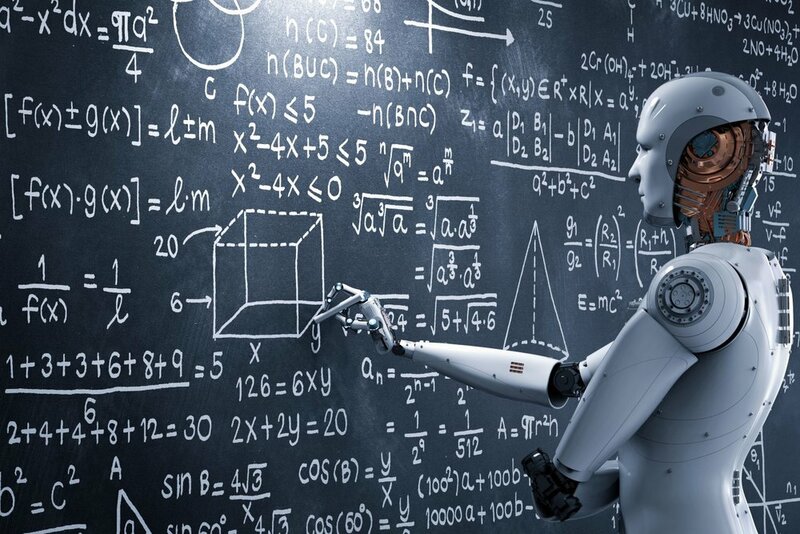 Students will be enrolled in a 10-week curriculum that will cover fundamental topics in AI including search and optimization, knowledge representation and reasoning, planning and decision-making, and machine learning and robotics. Additionally, students will be introduced to concepts across parallel computing, game theory, natural language processing, graphics and vision, and computational biology. Total of 600 students in STEM will be educated at TAIRC annually. Applied research: TAIRC will provide a space for graduate students, postdoctoral researchers, and scientists from local STEM-oriented institutions to conduct applied research in an AI laboratory equipped with workstations, servers, and access to deep learning software and accelerated analytics tools. The inaugural cohort will include 50 researchers who will be able to engage in 12-month research projects at the lab. 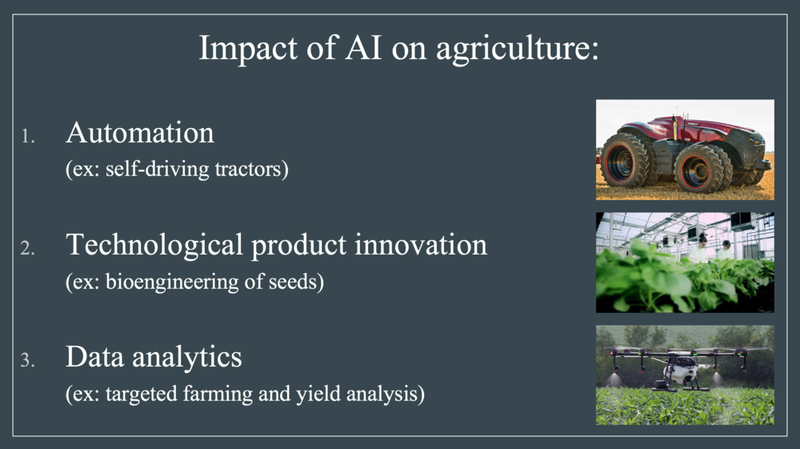 The researchers will be expected to work on applying AI in priority areas set for the project – agriculture, manufacturing, financial services, and healthcare. TAIRC was formulated in a research project on AI conducted by our Innovation Incubator team.